Carolina jessamine (Gelsemium sempervirens) is in the Gelsemiaceae, or trumpet flower, family and was formerly classified in the Loganiaceae family. 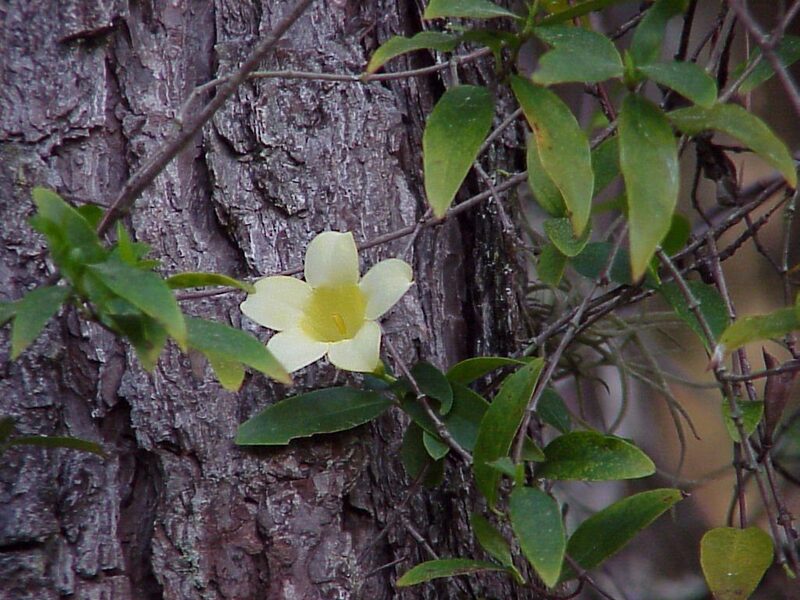 Some of its common names include yellow jasmine, Carolina jasmine, Carolina yellow jasmine, evening trumpet flower, woodbine, poor man’s rope and yellow jessamine. Gelsomino means jasmine and sempervirens means always green. It has been given a poor rap because of its misunderstood toxicity to bees. However, it is an excellent landscaping plant because it has beautiful evergreen foliage, brilliant yellow flowers, requires no maintenance once established, provides nectar for bees and is a good source of cover for songbirds. It grows in zones 7a to 11. It is native to Alabama, Arkansas, Florida, Georgia, Louisiana, Mississippi, North Carolina, South Carolina, Tennessee, Texas and Virginia. It is a perennial vine that grows to about 20 feet in length. It occurs naturally in well drained woodlands, pine flatwoods, sandhills, savannahs, fence rows, thickets and disturbed sites. It grows in part shade with average to dry soils. In the home landscape it can be trained to grow upon a trellis or left on its own to climb into the tree canopy. The evergreen leaves are found growing on short stalks and are opposite with entire margins. They may be lanceolate to elliptic in shape and will have a tapering point. They range in size from 2 – 3 inches in length and about ¾ of an inch wide. The fragrant, yellow, flowers are tubular in shape with flared petals. It is one of the first flowers to bloom in central Florida in late winter and brings a touch of brilliant color into the drab winter landscape. The flowers are about one and a half inches in width. 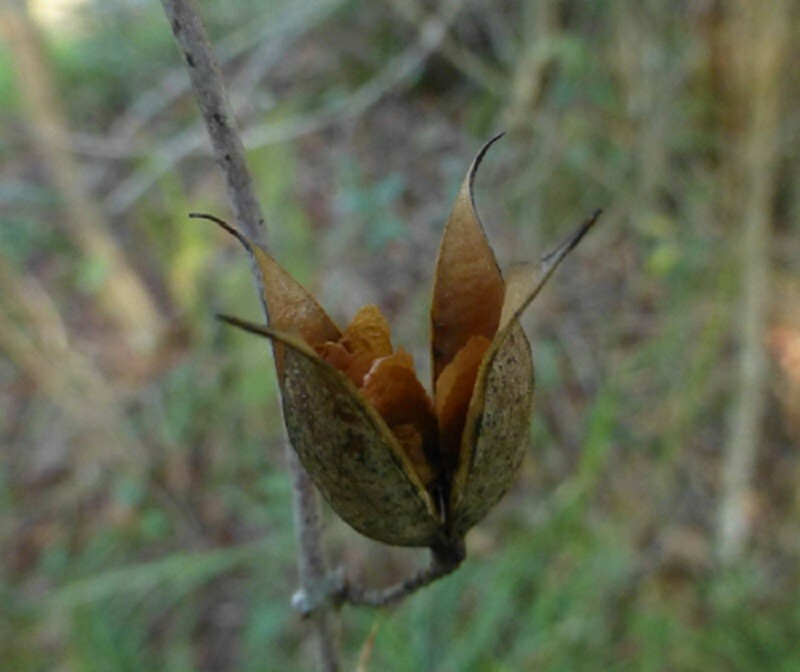 The seeds pods are about an inch long and about half an inch in width. Once they ripen and turn brown they will split open forming a cup holding the winged seeds. 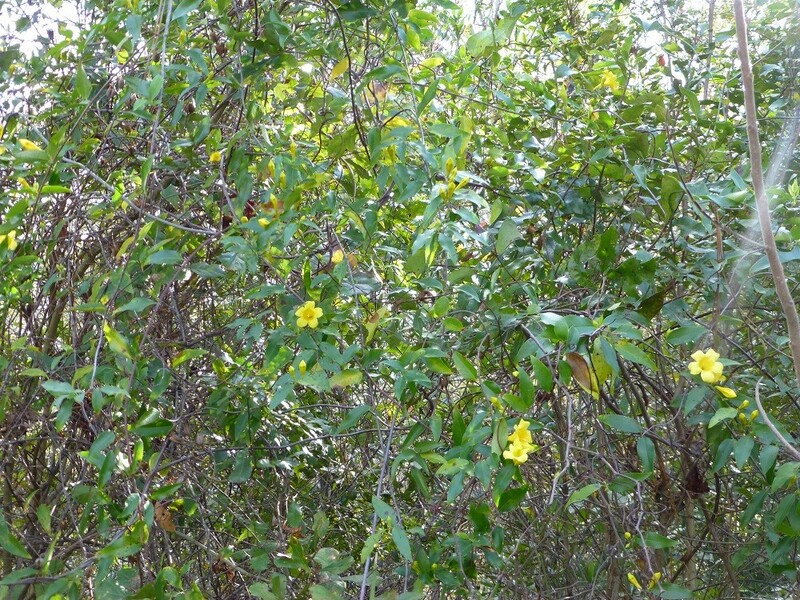 A variety of wildlife uses Carolina jessamine – from bees drinking nectar to birds using it as a source of cover from predators. Some varieties of bees that visit Carolina jessamine flowers are bumble bees, orchard bees and honey bees. It seems that native bees are savvy in regards to not overdoing it on the alkaloid containing nectar whereas European honeybees do not have the same instinct as many reports of it killing honeybees abound. It is probably not a good plant to have in abundance if you are a beekeeper. It seems that native bees, like humans with food or drugs, may at times ingest enough nectar to cause them harm and others not. Also the level of toxicity in the nectar also varies from plant to plant. Honey from the flowers is said to have a narcotic effect depending upon the concentration of the alkaloid. Apparently native bees seem to be able to know when to quit, but honey bees may consume enough nectar to kill themselves. All parts of the plant are toxic if ingested so keep this vine away from foraging livestock and fowl. Some people have reported skin irritation from the sap while trimming or handling the vine. The alkaloid gelsemicine is toxic and symptoms of toxicity are depressed respiration, tremors, paralysis of extremities, convulsions, urination, defecation, retchings and salivation. It has been reported to be deer resistant so if you have trouble with deer eating your landscaping this may be a good choice in that regard. Although this plant is poisonous it has been used for years homeopathically for many conditions such as nervous disorders, fevers, reducing inflammation, gonorrhea, cystitis, hysteria, malarial disorders, diphtheria, and meningitis. 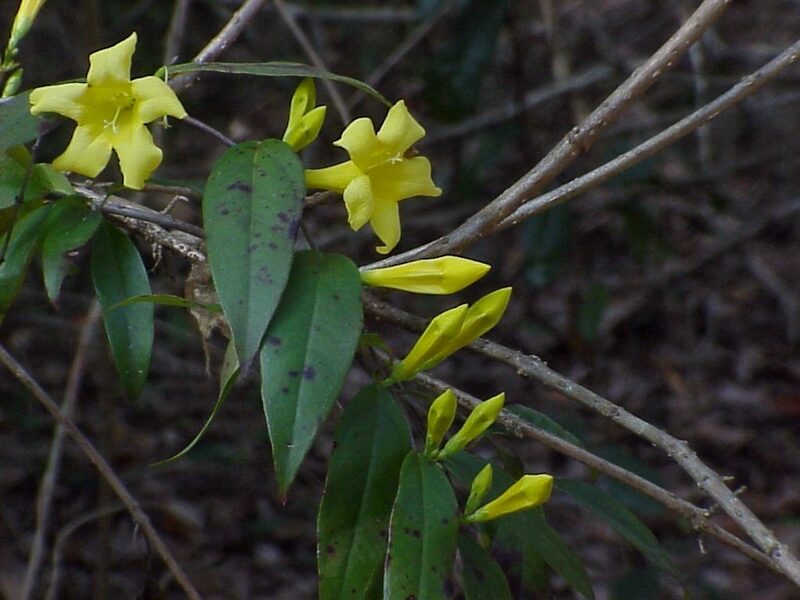 In 1855 Mr. Henry Kollock identified an alkaloid from Carolina jessamine which he named gelsemium. 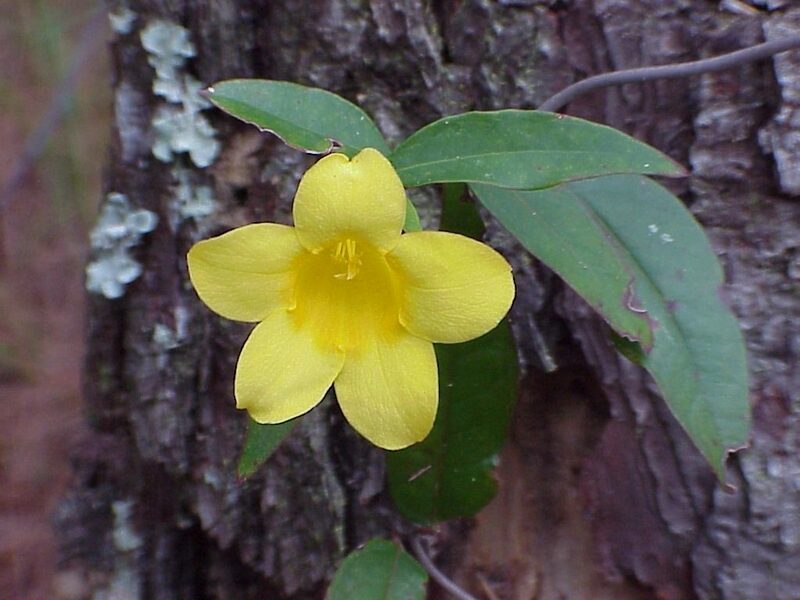 Gelsemium diminishes the blood supply to the brain and spinal cord retarding nerve function. In 1904 the Lloyd Brothers pharmacy created a product called Gelsemium Red which was used to treat the aforementioned illnesses. Today Gelsemium sempervirens is still used as a homeopathic remedy for stage fright, apprehension, and fever, and is available at your local health food store. I have always had this plant growing in my landscape and have never had any concerns with it. I love that it is maintenance free, evergreen, has gorgeous flowers and provides for wildlife. I rarely handle it except to trim unwanted growth or place it back upon its support and have never had a reaction to it, but I do keep in mind that it is poisonous. Propagation is achieved through seeds, cuttings and transplants. Buy Carolina jessamine seeds at Sharon’s Florida Ebay Store. Lloyd Brothers. Drug Treatise. Cincinnati, OH 1901.